Fans of classic racing games like Mario Kart or lesser brethren such as BC Racers and Toyland Racing might be interested in checking out this Disney themed racer. It's not quite in the same league as Nintendo's legendary franchise but it's another generally fine game bearing the Disney name which is well worth a look for fans. As is usual with this kind of thing, there's a wide variety of characters and tracks to choose from, with a mix of classics, such as Chip, Dale and Jimint Cricket and new ones created specifically the game. 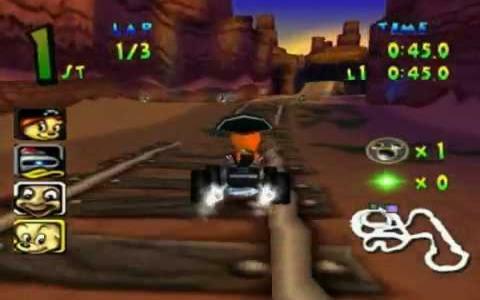 The tracks are largely based on the various theme park lands at Disney World, so this is your chance to race at high speeds around Haunted Mansion, Space Mountain, Thunder Mountain, Typhoon Lagoon and more, which is probably high on the list of things to do for any Disney fan. There are the usual short cuts to discover, as well as plenty of powerups to help you get the edge on your opponents, as well as the expected multi-player mode. All in all, this is a pretty decent and largely enjoyable racer. The game gets off to a good start with its impressive visuals, which recreate all the glory of the best loved theme park in the world, and fans will have a lot of fun just looking out for all the background details. Audio too is just as you would expect, with lots of authentic voiceovers and musical tracks which help add to the atmosphere. Controls too are tight and responsive, just as you'd hope for in such a thing, and really if there are criticisms to be made, it's that the characters and plot line are less than you' expect from a Disney game, with some of the least memorable characters and a dull story. Apart from this though, this is a fun racer.